If you are preparing for the NEET, AIIMS, JEE Main or any kind of engineering & medical entrance exams the following post will make sure that your preparation gets sharpened for an attempt that helps you ace the exam. Entrance Exams – be they for any trade, of any level and for any degree or job; are one of the best and the primary means to select the candidates for the next levels. This post focus on the Medical and Engineering Entrance Exams and how one can prepare for them following the 10 tips and tricks mentioned in the following sections. If you are preparing for the NEET, AIIMS and JEE Main, the following post will make sure that your preparation gets sharpened for an attempt that helps you ace the exam. The exams such as NEET and AIIMS are taken by millions of students and offer seats in few thousands. This means that your preparation should be done accordingly. Steer clear of the books and questions and the study material that is not of the level of the entrance exam. It is important to understand that though the exam will comprise questions from the same subjects, the level of questions will vary greatly. Always remember that just like a kid cannot learn to write and read in one day or 10 days or even a month, the exam preparation for NEET, AIIMS and JEE Main etc cannot be done in few days or one month. Don't get notions of getting some crash course for qualifying the exam. The preparation spans over two years for the students in Class XI and one year for the students in Class XII. Learn new concepts and topics from every subject daily and practice the questions on that topic on that day itself. Some students make the mistake of making one subject as their favorite and prepare only that subject. The students enrolled in the top IIT JEE Coaching Centers have an alienation towards Maths and the ones preparing for NEET and AIIMS etc are biased towards Biology. Though the inclination is not bad; ignoring the Physics and Chemistry can lead to failure. Give equal time to all the subjects and revise them regularly as well. Try to understand that all the candidates that are preparing for the Engineering Entrance Exam will be good at Maths. This means that excelling in Maths only cannot guarantee an admission in your dream Engineering College. Your expertise in Chemistry and Physics is what that will make a difference in your score. Form a routine in which you prepare 2 to 3 topics from each subject daily. Learn the concepts, and first solve the conceptual questions based on them. They will clear your basics. After that proceed with the questions in the reference books that will test your understanding of the topics you have learned. The next step towards a comprehensive preparation will be to solve the questions from the sample papers and the previous year question papers. This process will take some time and effort to become a routine but will make your preparation foolproof and perfect. This is one such step that will actually boost you mentally so that you are prepared for any exam. Keep a diary with three sections for three subjects; Namely – PCM or PCB. Write down the topic that you have prepared today with the date against its name. Write only after you have covered a topic completely and no doubts or questions are left. With passing time, the diary will populate and motivate you to stay positive. Write down the name reactions, facts, formulas and other tricks for remembering and learning on the wallpaper and paste that on the walls of your room. Put the Periodic Table on the Roof or the door of your wardrobe. Revise them daily while going to the bed and when you wake up in the morning. There are loads of coaching centres that claim to be the best IIT-JEE Entrance Exam Centers and have very less fees. Don't get lured by such offers and choose the best preparation partner for a breakthrough performance. The Alpha Entrance Academy is the best Engineering Entrance Coaching Centers in Kerala that has produced scintillating results. Alpha offers the best preparation methodology and end-to-end support for all the students and is one of the best Medical Entrance Coaching Centers in Alappuzha. The students are prepared as per the latest guidelines and syllabus of the exams such as NEET, AIIMS etc. The only thing except the lack of preparation that can harm your exam performance is stress. Stress, can make you attempt blunders and even affect the marking of answers. Hence, keep it at bay. It is important that you keep track of the negative responses marked by you while solving the mock tests at the coaching centers as well as online. The number of negative responses should decrease as the exam day approaches. This will ensure that you keep your urge to mark some answer whether you know it or not, under control and thus don't suffer owing to negative marking. Rest, join Alpha to deliver a performance of a lifetime..!!! This article gives information about IIT Entrance exam in details. This resource describes the exams that are available for a student after the completion of graduate study. This article provides a list of the best study tips to crack any entrance exam in India. This articles provides information on the eligibility criteria and various aspects of IIT-JEE exams in India. 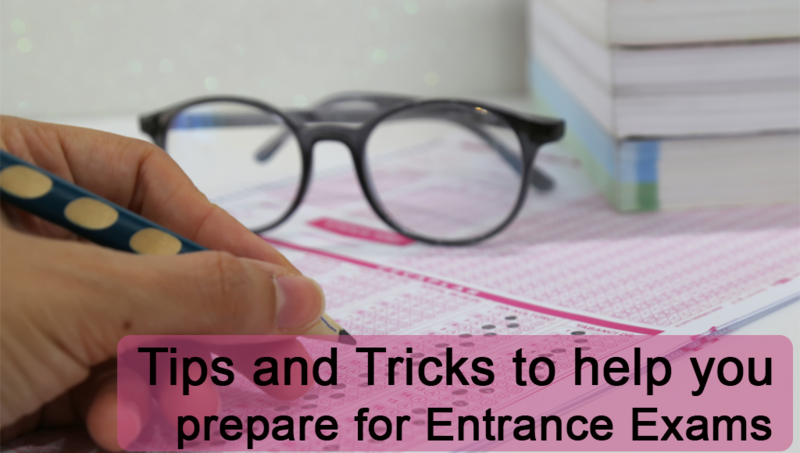 An excellent and useful article on the effective preparation tips on entrance examinations. The author has covered almost all aspects of preparation for the entrance examinations. I would like to add a few points. (i) Time Management: It is absolutely essential. During the preparation stage, the candidates must appear in mock tests based on the question pattern of the specific entrance examination. The student must try his/her level best to complete the paper within the stipulated time. Continuous practice (mock test) within the stipulated time would help the candidates to ward off time pressure. (ii) Reading the question carefully before attempting: In case of pen and OMR sheet based entrance examination, a candidate is required to encircle the correct answer out of four alternatives. But if he/she marks the wrong answer, and want to change it subsequently, there is no such provision. So, the candidates must read the question more than once, before marking the answer. (iii) Intelligent guess: In the entrance examinations, there is a provision of negative marking. Generally, for each correct answer, the candidates get 4 marks for each correct answer and - 1mark for each incorrect answer. So, the candidates must resort to Intelligent guess. They must learn to eliminate the totally wrong/impossible answers (generally two out of four alternatives) and guess the correct answer from the other two. In that case, the probability of choosing correct answer increases. Serious and systematic preparation for one year or more generally enables even average students to clear any competitive examination. A very exhaustive article and good guidelines for students preparing for competitive exams. Today the environment is very very competitive and there is a cut throat competition everywhere. Students who are doing superficial studies will not be able to have any success in these exams and what is required is a thorough involvement in the studies and take it as a challenge rather then a plain syllabus. I also strongly believe that thorough preparation not only increases the chances of qualifying in the current exam but also any future exam which may come in the way of making a successful career. So resorting to select or guess paper activities should not be adhered to at any cost. That will simply be a wastage of the precious time. Yes this is the right article which must be given credence by all those students who are going to write various national competition exams including NEET. As far NEET is concerned, my daughter wrote 240 tests every alternate day and the marks were hoisted on the net which made comparison to probable ranking in main exam. The way she was maintaining consistency in the scores has proved time and again that she will secure state rank below 2000 and that has happened and luckily she got the MBBS seat in ESI. So what I means to say that practice makes perfect and my daughter really done hard work. And she also learned the time management aspect. That she would take any question paper and has the stop watch with her and thus used to manage the time so that in exam center also she has to fasten the belt and answer the questions with same speed. A nice article bringing out the tips for getting successful in the exam. One of the most important aspect to be considered for getting qualified in any exam is how early one is able to start preparing for it. This is a crucial thing and is true for any exam. For example if a person wants to qualify in exam like IAS or similar one, he has to prepare or rather plan for it right from his high school times. It is not so that just after graduation one feels that one has to appear in an exam and starts preparing. In today's competitive environment a long term strategy is required for such success. Many parents know this and guide their children accordingly. We should remember that if we read too much in less time, our retention will be poor but same thing if done distributed in a longer interval it remains with us.